A University of Plymouth medical student has won a national competition recognising the best surgical skills in the UK. 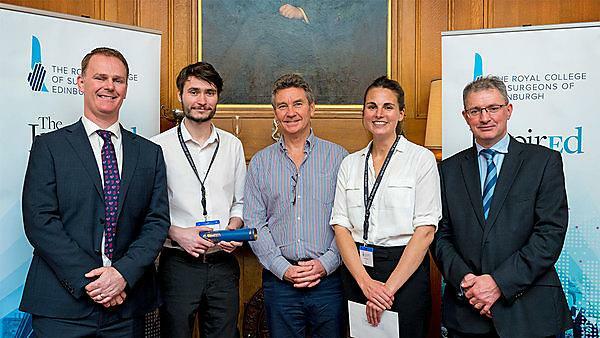 Final-year student James Russell won the National Surgical Skills Competition, run by the Royal College of Surgeons of Edinburgh (RCSEd) with sponsors Medtronic, after beating off competition from peers at all other medical schools across the UK. Completing a number of manual dexterity tasks along with communication challenges such as breaking bad news, competitors had to complete eight stations, which were judged by RCSEd College Office Bearers, Council Members and Regional Advisors. Competitors were invited to compete in the national final after winning their respective regional rounds in September. With only eight per cent of medical undergraduates qualifying as surgeons in one of the 10 specialties, surgery is an incredibly competitive area, so being able to demonstrate the commitment and the skills to become a surgeon at this early stage puts students at a great advantage later in their career. Having won, James will be one of the first in the UK to experience new technology from medical device company, Medtronic. The new Visionsense™ VS3 Iridium system allows surgeons to visualise and assess tissue perfusion with real time qualitative and quantitative measurement of infrared intensity, confirming or enhancing surgical judgement to optimise outcomes. "RCSEd is committed to fostering relationships with the undergraduate medical schools in the UK and this competition provides an excellent platform. I am delighted to offer my congratulations to James and wish all students who took part every success in the next step of their medical careers."